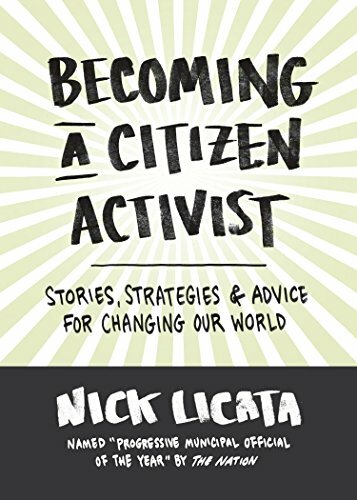 Nick Licata, who served four terms on the Seattle City Council, has written a book that proclaims to help educate people on how to become citizen activists but is rather a more local and autobiographic piece. Despite a front page that suggests “stories, strategies and advice for changing our world” Becoming a Citizen Activist: Stories, Strategies and Advice for Changing the World feels very much like a local perspective. There is still a value in that, and Licata’s experience of how power works and the impact of organized networks to engage with it is well told in local instances, including a campaign for the minimum wage, a monorail, or even against plastic bags. Becoming a Citizen Activist is very much for the basic campaigner as is somewhat fluffy and obvious with lines such as "when legislation is being written, it is important to pay attention," or “search the Internet for evidence linked to your campaign,” and slightly more bizarrely "always helps to hold a press event at a location where reporters can quaff a beer while covering a story." What is extremely interesting but not fully developed are Licata’s arguments around the use of "politics as a means to allow the weak to challenge the more powerful." Licata loves citizen commissions, and his track record of involvement in LGBT issues, immigrant campaigns, and student protests in Seattle reads like an interesting history. In terms of activist tools, Licata runs through a standard list of insider-outsider tactics, power mapping, the tools of stunts and public protest, and how to develop effective interaction with politicians. Cynics would argue that much of the book’s celebrations of Licata’s own successes reads as an “ego trip,” and there is definitely an argument that he should have made this more this explicitly his autobiography. For a more innovative and global look at citizen activism try Srdja Popovic’s Blueprint for Revolution.